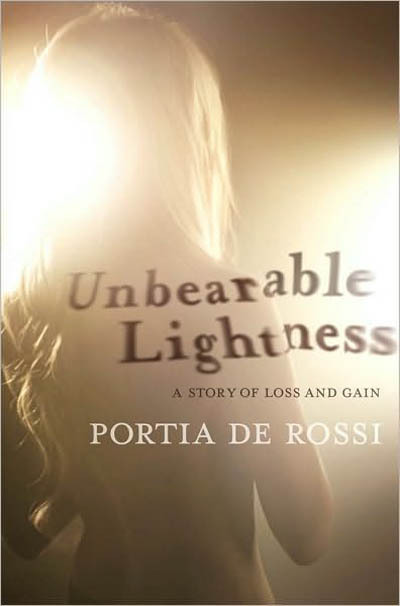 I wasn’t overly familiar with Portia De Rossi (now DeGeneres) prior to reading this book. All I really knew was she acted on Arrested Development (which was brilliant) and single-handedly destroyed 1,001 lesbian stereotypes. However, no more than 10 pages into the book, I felt as though I knew her extremely well. It wasn’t because of the honest and frank details she shared through her writing; I knew her because she was the spitting image of so many of the women with whom I work. The book is her personal account (there was no ghostwriter) of her life and struggles with an eating disorder and her sexuality. I would say over 80% of the book is focused on her issues with bulimia, anorexia, and compulsive exercise. She collapsed at her bottom, at a height of 5’8,” weighing 82 pounds. After this she was examined by doctors and told she had bone and liver deficiencies; she had been misdiagnosed with lupus. You could be thinking, “Great, another book about an eating disorder. Just what we need!” I have read quite a few books and memoirs on the subject, not to mention my real life experiences, and I can easily say this memoir is at the top of my list for touching on the reality of these situations while being an extremely interesting (and at times intense) read. She wasn’t afraid to “go there,” but it wasn’t dramatic or trite. It was just the right amount of exposure. I like that she doesn’t end the book in a “the birds are singing and the world is shinning” kind of way. Self-admittedly, she is still dealing with certain issues and healing. Overall, it is a great read. Obviously, a memoir isn’t the standard type of book I review on the site. There is an important reason I chose to review this particular one, put up the podcast I did this week, and the post about the blood tests. Everyday, sometimes multiple times per day, I get an email begging for help. These emails that can sometimes be 2,000+ words are always layered with panic and anxiety, and the people who write them always seem to be running out of hope. The number one question I get at this time is, “When is the MRM going to be rereleased?” I do the best I can to answer these emails, but there is only so much time in a day. I used to refer people to the MRM and call it a day; I didn’t realize how many people were affected and helped by that book. Recently, I have had an increasingly large influx of email. I highly doubt it’s just my ever growing and adoring fan base. Be it the state of our current industry or the pressures of the world—things are getting worse in the area of eating disorders. I cannot stress enough how important it is to take these issues seriously and hit them head on. Because of all this, I am putting a higher priority on the rewrite. It will include even more detailed information and help (I hope) more than before. I am also setting up a separate email list for those who want information on this type of stuff specifically and for when the book comes out. It will be the best way to stay updated in general. If you are interested please sign up below. I am going to do what I can to try and get the book rewritten and edited by the new year. Stay tuned. I read this book a few days ago and it is amazing. Portia writes very beautifully and with a poignant undertone. I am still in the stages of recovering from my eating disorder. I have carried it with me since 14 years old and got down to 93lbs myself. It is important for multiple speakers on these issues. It would be great Leigh if you could do an article in the future about the long term effects and what to expect. I still don’t feel completely “right” after my experiences. There will be stuff on this in the future. I will say off the cuff, I find the issues with full recovery lie with action less that anatomy. Just ordered it on itunes. So excited! Curious, is she the reader? I know I could look it up, but having a lazy day. Yes, the audiobook is read by De Rossi and it is amazingly well read. This book has changed my life. Leigh, I know it might not be the “fun” writing and research, but we need your help! Thank you for doing this book review, I am looking so so forward to reading it. I apologize if I missed something, but what is the “MRM” book? Thanks Grainne. There I ago, assuming everyone knows everything. The Metabolic Repair Manual was a book released for a while that dealt with helping heal metabolic issues brought on by dieting and exercise habits I am editing them now, and will be re-releasing it soon. I saw her on Oprah and so much of what she said was me as well. I did well for a while but here lately have been not doing so well. I hate when ED rears it’s ugly head. I have MRM but am anxious for the update. Fantastic book! Had the pleasure of attending her book signing in NYC. What a wonderful person. Please visit our Group PORTIA FANS – A Lovely Place for a Lovely Lady. On the Ellen community! Heh, couldn’t even if I wanted to. North Carolina tax laws don’t allow for most affiliate sales through major merchants. That is why 90% of stuff I talk about will not be an affiliate sale. But then, I would never talk about something I would sale, that I wouldn’t talk about for free anyway, so it doesn’t really matter. I love Ellen and what she gives back to life. And her life partner, Portia, is a lovely lady. I wish Portia much success in spreading the knowledge through her book. I do not have an eating disorder and my overall opinion of sexuality is that most of us are pretty screwed up about it a good deal of our lives until we get our head straight. Whether heterosexual or gay, the same problems abound in our lives. It is a fact of human life. Meanwhile, you go, girl. And fair winds be with you. How do you know she didn’t use a ghostwriter? I’ve been trying to find out, and this is the first place I’ve seen that has an answer; I was just wondering where you found out. On a different note, I LOVED Unbearable lightness! I have an eating disorder, and I just came out as bisexual, and there was a lot to relate to in her book. Tuesday- She said that on the Ellen DeGeneres Show. hey there…………does anyone have a copy of the MRM they may want to loan/sell to me?? I am DESPERATE to overcome my eating disorder (for both myself AND my 5 DAUGHTERS (from 12 down to 4………one with special needs).